Our mission is to help honey bees and native pollinators by creating healthy habitats and strong pollinator health. We passionately raise bees to produce quality honey and beeswax products that are healthy for human consumers, bees and the environment. Furthermore, we are a local family owned business that inspires to support and educate the community about sustainable farming and living practices involving pollinators. Kaylee's mother Laurie hugging the hive... because, you know we love the bees that much! 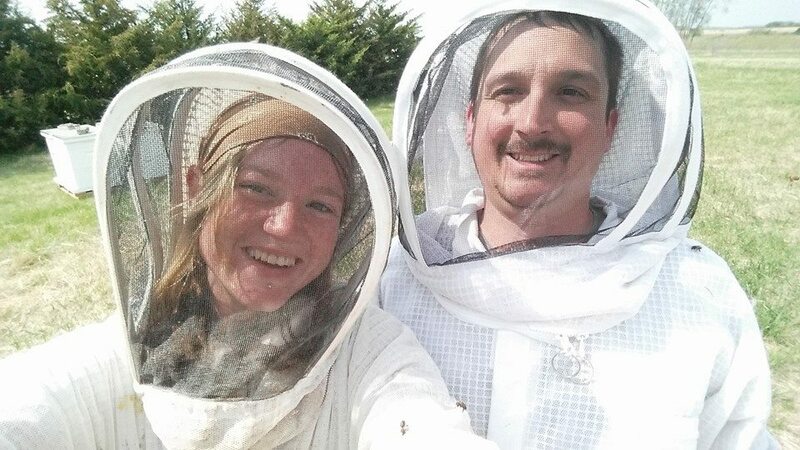 In 2013, Kaylee started working for Harris and Rose Tinklenberg of Harris Honey Company. 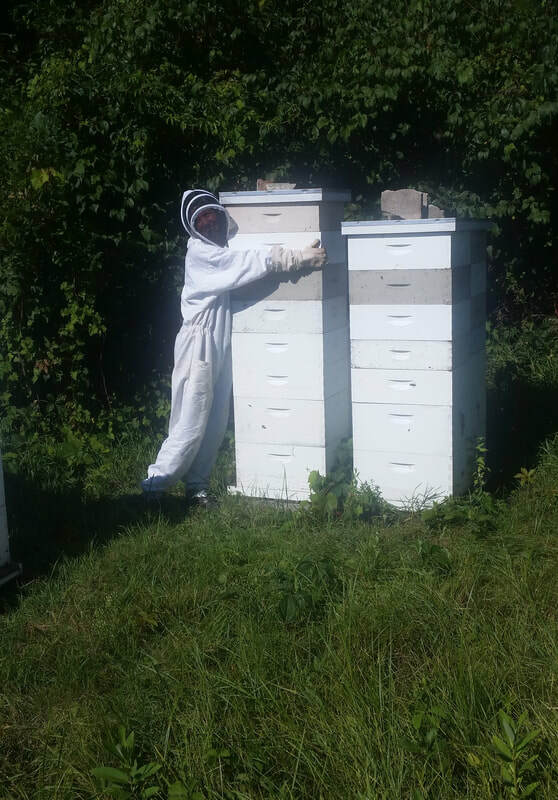 In 2014, we started with four honey bee colonies on our farm site, by the end of that year we started Moody Bees Honey. In 2016 we purchased and started the transition of Harris Honey Company. Our current numbers hover between 200-300 hives, we aim to have around 500 by the end of 2019. Each year we continue to change and evolve. Learning from our honey bees and the local ecosystems. We raise our bees in Langstroth hives. Located in prairies, forested areas, river bottoms and farms all around Blue Earth County in Southern Minnesota. When picking "bee yards" we try to avoid areas with heavy chemical exposure and pollution. Although it is tricky in Southern Minnesota with all the conventional agriculture. We do not use any antibiotics in the hives. Although we do currently use plant based mite treatment in the hives, it is never applied during honey production. We are also experimenting with Treatment free beekeeping in hopes of strengthening the health of our honey bees. Our farm started with a few chickens and a small vegetable garden. Growing to basically become a zoo, with a sizable market garden. Now we just raise a small herd of goats and a donkey named Buttercup. The goats are fantastic plant control, because our farm is completely chemical free. Although we still have a small garden, most of the eight acres we steward is being converted back into natural ecosystems. These prairies and woodland gardens will be used as educational tools to teach others how to plant for pollinators, create healthy wildlife gardens and how sustainably forage for wild food and medicine. Our goal is to create a pollinator and wildlife oasis in the vast desert sea of commercial agriculture. Kaylee attended South Central College and earned an Agribusiness and Production Degree with a focus on Diversified Systems. During her education she participated in a five-month internship with the Regional Ecologist at the MN-DNR studying native plants and pollinators. Kaylee also has apprenticed under Harris Tinklingberg of Harris Honey Company. Jason attended South Central College as well and earned an Associates in Computer Networking Degree. He currently works for the District 77 school system in Mankato, Minnesota. His training and experience with technology helps keep MBH on the cutting edge. Jason is also the all around handy man of the farm.